Corneal Refractive Therapy (CRT) is a technically advanced, non-surgical process, which reshapes your cornea while you sleep. This is a fantastic option for patients who lead an active lifestyle, athletes, or for people who do not want to be concerned with wearing lenses during the day. The best candidate are adults and adolescents who wear soft contact lenses and glasses and complain of inconvenience, interference with outdoor and sporting activities, irritation from allergies, dust, and wind, care and handling problems, and lost or torn lenses. This is also an ideal non-surgical option for patients interested in refractive surgery but do not proceed because of the fear of surgery, fear of poor outcome, fear of irreversibility, age, and cost. CRT utilizes a specially designed lens worn while you sleep so upon wakening you are able to remove the lens and see clearly throughout the day without the need for glasses. 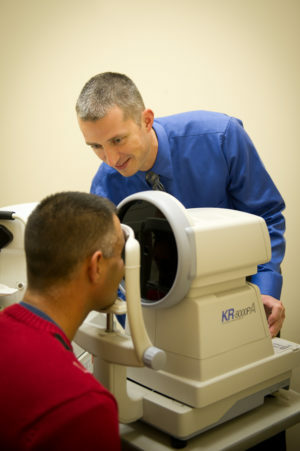 The result is great vision 24 hours a day for the correction of myopia (nearsightedness) and myopia with astigmatism. Our doctors prefer the Paragon CRT lens system because it is the only FDA approved lens and is both safe and effective for patients of all ages when worn during sleeping hours. Unlike laser surgery, CRT is roughly one half the cost of laser surgery and is reversible should the cornea not respond as anticipated. Additionally, this therapy system has been in existence for roughly 50 years so the long term consequences are largely known.